I choose my vaccination protocols based on the most recent vaccination guidelines provided by the American Animal Hospital Association (AAHA) for dogs and The American Association of Feline Practitioners (AAFP) for cats. Not all pets need every vaccine. I will ask you questions about your pet’s lifestyle, environment, and travel to help tailor the perfect vaccination plan. There are “core” and “noncore” vaccines. Vaccinations are designated as either core, meaning they are recommended for every pet, or noncore, which means they are recommended for pets at risk for contracting a specific disease. DHPP: Distemper, Adenvirus-2, Parvovirus, Parainfluenza. Begin a series of 2-3 vaccines as early as 8 weeks of age. The same vaccine is repeated every 3-4 weeks until the dog reaches 16 weeks of age. A booster of the same vaccine is needed in 1 year, then every 3 years thereafter. Rabies: Only one initial vaccine is required for puppies at 16-20 weeks of age. The same vaccine is given 1 year later, then a booster vaccine is needed every 3 years or as required by State or local ordinance. Any vaccine can be used for revaccination, even if the product is not the same brand. Bordatella: Bordatella Bronchiseptica. Also known as kennel cough vaccine. 2 vaccines are given one month apart initially, followed by an annual booster. A booster may be given every 6 months, if required by a boarding, grooming or day care facility. Leptospirosis: Leptospira Interrogans. Risk is through exposure to contaminated water, soil, reproductive secretions and infected tissue. I will discuss potential risk at the time of examination. A series of 2 initial vaccines, 2-4 weeks apart, are given to dogs at 12 weeks of age or older. Lyme Disease: Borrelia Burdoferi. Exposure to ticks constitutes high risk. Puppies may be vaccinated at 9-12 weeks of age, with a second vaccination required 2-4 weeks later. Adult dogs need 2 initial vaccines, 2-4 weeks apart. An annual vaccine is recommended at the start of tick season. Influenza: (H3N8 and H3N2). This vaccine should be given when dogs participate in activities with many dogs or to those who live in an intensive communal housing facility. I recommend the bivalent vaccine that protects against both strains (Merck Novobac). It should be given twice, 3 weeks apart, to dogs 8 weeks of age or older. Rattlesnake: vaccine causes dog to produce antibodies against the venom of the Western Diamondback and also protects against some other rattlesnake bite reactions. 2 vaccines are given one month apart. An annual booster is recommended each spring before the start of rattlesnake season or twice a year if exposure exists all year. Anitivenom is recommended after a rattlesnake bite even if the dog has been vaccinated. *Excerpts published with permission from the American Animal Hospital Association Vaccination Guidelines for Dogs, revised 2017. Begin as early as 6 weeks of age, then every 3-4 weeks until 16 weeks of age. A single dose is given 1 year following the last dose of the initial series, then no more frequently than every 3 years. Only a single dose is needed, as early as 8 or 12 weeks of age depending on the product label. Revaccinate 1 year later. Administer 2 doses, 12 months apart. Annual booster is required. Then a booster is given very 3 years or as required by State or local ordinance. Any rabies vaccine can be used for revaccination, even if the product is not the same brand. An initial dose should be given as early as 8 – 12 weeks of age. A second dose should be administered 3-4 weeks later. When indicated, a single dose is given 1 year following the last dose of the initial series, then annually in cats determined to have sustained risk of exposure. FeLV vaccination is highly recommended for all kittens. • Booster inoculation is recommended only in cats considered to be at risk of exposure. • Only FeLV negative cats should be vaccinated; FeLV testing prior to vaccine administration is recommended. • Cats should be tested for FeLV infection before their initial vaccination and when there is a possibility that they have been exposed to FeLV since they were last vaccinated. Feline Immunodeficiency Virus (FIV): I do not currently recommend this vaccine since antibodies develop which will cause a cat to test positive for FIV for life. The antibodies produced by the vaccine can’t be distinguished from naturally occurring FIV by any available testing method. Chlamydophila felis (formerly Chlamydia psittaci var felis): Vaccination may potentially be considered as part of a control regime for cats in multiple-cat environments where infections associated with clinical disease have been confirmed. The goal of this vaccine is to lessen clinical signs in cats exposed to this disease. Vaccine schedules vary between manufacturers. Feline Infectious Peritonitis (FIP): There is controversy over the use of this vaccine and I do not recommend it. Most cats have immunity by one year of age without being vaccinated. The vaccine may not produce sufficient immunity to protect against the disease. *Excerpts printed with permission from the American Association of Feline Practitioners, Vaccine Guidelines 2006 revised 2013. Get a rabies vaccine for your dog—it’s the law. Rabies is a fatal—and preventable—disease that can be spread to humans by contact with saliva, so it’s mandatory in all 50 US states. 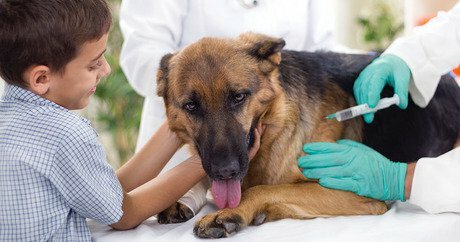 Your veterinarian is bound by law to give your dog a rabies vaccine to protect you as well as your pet; if an unvaccinated dog is scratched or bitten by a wild animal, it can lead to your pet being quarantined or euthanized. Titers, or quantitative antibody testing, can help determine your dog or cats’s protection from some diseases. Titer testing can help when a vaccination history is unknown. A positive result typically means the pet is considered protected. However, no test is 100% accurate, so in areas where these diseases run rampant, I may still recommend vaccinating. While titer testing for rabies is available, the law still requires that the dog be vaccinated since this is a fatal, zoonotic (i.e., can be spread to people) disease. Some vaccines only need boosters every three years. For example, DHPP, a combination of distemper, adenovirus, and parvovirus vaccine for dogs or the FVRCP vaccine for cats, can be given every three years after the pet has completed the initial series of inoculations. An animal’s immunity is as individual as they are, so if you want to have more certainty that they are protected, have a titer performed to measure the amount of antibody response they have to these diseases. Protect at-risk dogs annually from certain complex diseases. If your dog is at risk for Lyme disease, leptospirosis, influenza and/or Bordetella (kennel cough), you’ll want to vaccinate him every 6 months or every year, instead of every three years. Serious vaccine reactions are rare. The risk of contracting a dangerous disease by not vaccinating a dog or cat outweighs the risk of the vaccine. Please seek veterinary help immediately if your pet vomits, develops hives, facial swelling or difficulty breathing after vaccination. Don’t administer vaccines to your pet by yourself. While vaccines are available through sources other than your veterinarian, they may not protect your pet against disease unless they are properly stored, handled, and administered. Smaller doses of a vaccine do not help prevent adverse reactions in small dogs. In fact, the entire dose of a vaccine is necessary to produce protective immunity.